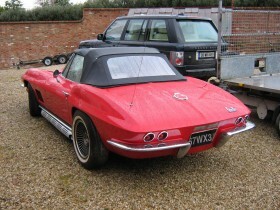 Martins 67 roadster had suffered a bit over the years and was well in need of some attention. Martin had already started to strip the car at home, removing a few bits and pieces. 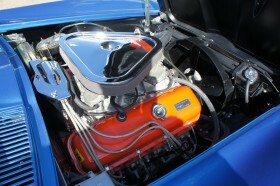 Notice the small block alternator bracket and the home made brace. 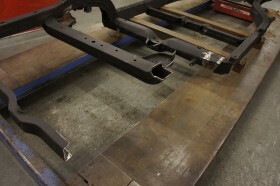 Fast forward a month now and the body has been removed, everything cleaned and stripped, the chassis sandblasted and primed ready for the serious work to begin. There was a lot uncovered when the car was stripped, this car had some racing history form its early days and there were plenty of battle scars to prove it. Some of the suspension components in the paint shop, the new bushes have been installed and they are about to receive the last coats of satin black. 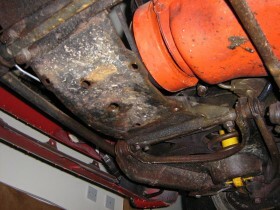 The upper A arm complete with the new bushings installed and a new upper ball joint. 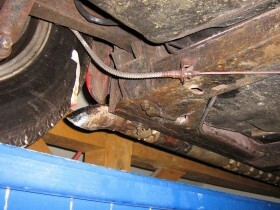 The driveshafts were given the same treatment, after the old U/J's were removed, the driveshafts were sandblasted and repainted, then new U/J's installed. The rebushed and repainted trailing arms were rebuilt with new bearings, along with new disc backing plates and handbrake internals. Front hubs were also rebuilt with new bearings and backing plates. 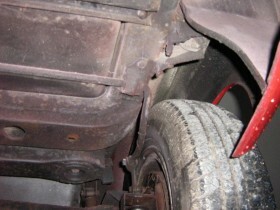 This shows some of the damage to the inner fenders, there were plenty of cracks that needed repair. The mighty 427 fresh out of the paint shop. And it doesn't stop there. 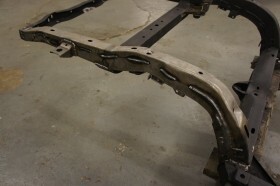 This is the diff crossmember mount that has suffered prior damage. 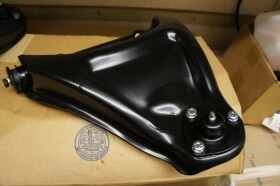 The second picture is the front lower A arm mount that has been bent. 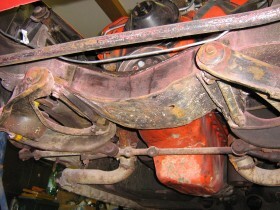 The rear chassis leg was bent quite badly out of shape, hence the modified number 4 body mount. There were various other areas of damage on the leg and it was deemed replacement of the entire chassis leg was in order. The new chassis leg installed. 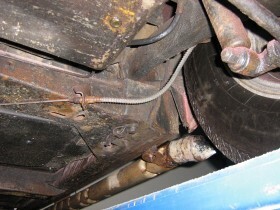 Other repairs were made to the diff crossmember mount and the A arm mount also. 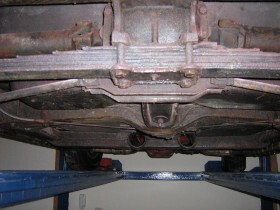 After the differential is cleaned the rear cover is removed so the side yoke seals and diff gasket can be replaced. 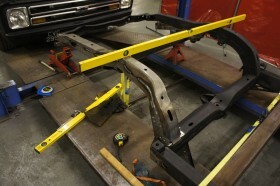 At the same time the finished chassis receives its primer and then satin black topcoat. 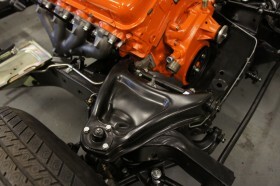 After the inner fenders were repaired the rest of the engine bay and firewall were prepped and given the satin black treatment, as was the underbody and wheel wells. 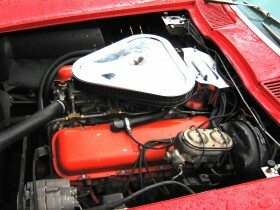 After that we reinstalled the recored radiator and the new brake booster and master cylinder. We also cleaned and repaired the wiring harnesses as necessary. What a difference! 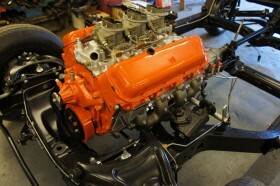 The engine and chassis mated together once again and looking very nice. Everything re-bushed and rebuilt with new callipers, fuel and brake lines. The monstrous 427 back in place. 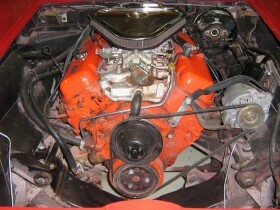 This was cleaned and repainted and the intake manifold cleaned and reinstalled with new gaskets. Carburettors rebuilt, exhaust manifolds blasted and treated. A lot of work but looks great. It was at this time that Martin decided that he wanted us to paint the car back in its original Marina blue so we got to stripping the paint, we had an inkling that there would be problems under the paint but we weren't expecting quite as much as we found. 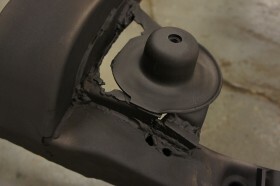 The back end was pretty thick with body filler, this is the area round the deckled and left rear fender. This also shows the damage to both door skins by the handle. The main problems were at the front end. The bodywork here had been poorly repaired in the past just about everywhere. We decided the best course of action was to replace the front end in its entirety. Not something to be entered into lightly though. It is a massive amount of work. This is the preliminary trial fit and trimming. We also replaced the left rear fender. once the body panels are bonded into place it is time to fit and align headlights, drill holes for emblems, park lights, door gaps have to be sanded out and so on. Will it ever end??? Finally in primer and looking very smart. After so long in the bodywork stage it really makes a difference to see the car in one colour again, even if it is olive drab! The final prep before topcoat, exciting times! Back in blue again and looking magnificent. 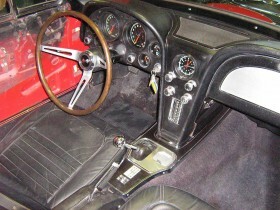 New carpets getting installed and the refurbished dash cluster installed. Interior just about finished, carpets and dash in, the glovebox door has had a new aluminium insert fitted and a set of 3 point seat belts fitted. The shift console has been refurbished and everything looking good. Finished...And looking lovely. 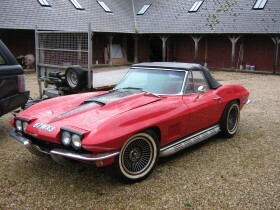 I was very pleased that Martin decided to refinish the car in the correct colour. The car drove superbly and was, as you would expect, very fast, very loud, and very lovely!